JEAN JACOB watches unite classic design elements with contemporary craftsmanship, honouring a man who made it his mission in life to measure time, elegantly. Our collections speak a language that resonates with many: quality over quantity, simplicity over complexity. Jean Jacob (1793 to 1871) was a master craftsman from Paris, France who attained icon status with his innovative chronometer watches and longcase clocks. Inspired by his genius, we set out to produce a range of timepieces featuring streamlined designs and precision mechanics. The Design British Body, Swiss Heart, French Soul. Frustrated with inferior watches made by companies that value profit over integrity, we seek to challenge the industry’s questionable manufacturing methods with timepieces that pay homage to artistry. Taking over 21 months to complete the development phase of our first ever collections, we measured hundreds of wrists to ensure every watch would deliver premium comfort and sophistication. Made to hug your wrist like a second skin, a JEAN JACOB timepiece is an item you can’t live without. Life’s greatest accessory reworked for the modern age, as stylish as it is smart. What makes a JEAN JACOB watch the epitome of elegance? A glinting ring of rose gold, a cool circle of silver? Maybe it’s butter-soft Italian leather imbued with alligator skin patterning or an unexpected ribbon of red running along a durable NATO band. Wholly versatile, each timepiece can be interchanged with 8 different straps, so you can customise the look depending on your mood, schedule or outfit. 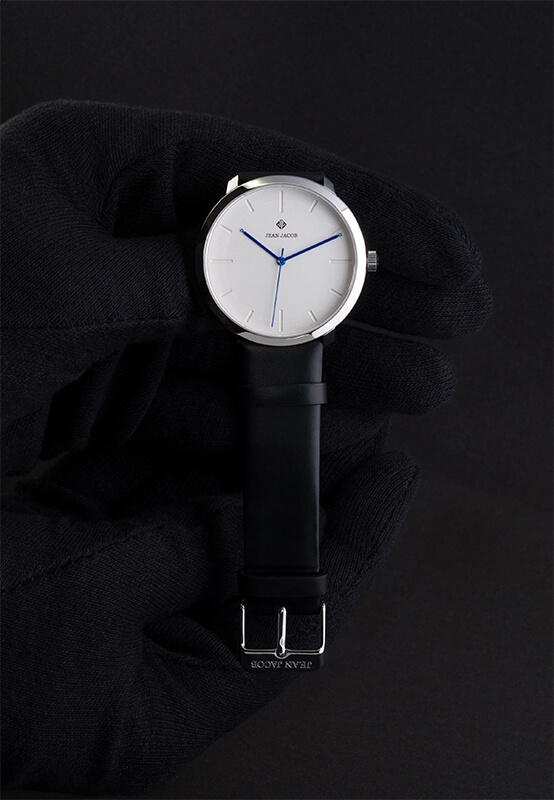 The dial’s delicate clock hands keep you aligned with life’s own unique rhythms. Man or woman, corporate or casual, it’s time to embody the JEAN JACOB spirit. Nostalgic for the past yet eager for innovation, our company honours all that came before whilst focusing on tomorrow. You’re invited to be a part of history (in the making).